Every day or so it seems we hear the cry of "look at this (insert any product here)...can I have that?" It is natural since everywhere they turn they are bombarded with the perfect "thing" that will simply change their lives. The Madison Avenue advertising machine is working quite well thank you and it's impact is felt in my home as I am sure in most of yours. Impressionable young children, naive in this consumer society that we live in, only want to succumb to the latest trend that is all the craze or to own the latest toy or electronic item this season. We think the time has come to begin an allowance so that some understanding that there is no money tree in our back yard can come into play. They do not get most things that they want; other than what they receive for presents at holiday time and the once in a great blue moon when we just want to do something special for our two very good kiddos. The only way to really learn about money is to have it. Now that they are in the first grade and their wants have gotten greater, we think the time has come to give them some money management tools to help them sort it out. I learned a great deal about this when I parented Justin and I think I did well, as he is a good money manager. His downfall though is the same as my own and that is electronic gadgets. Back in the day there were not as many as there are now, but I did indulge myself in quite a few when my means were greater. This is where the recession and the impact that it has had on our pocketbook may come in handy. The children do not see us buying every new gadget on the market. We simply cannot do that now....it's probably a very good thing. I cannot for the life of me remember how much we gave Justin to start off but after doing some research online about this subject, it seems that a reasonable amount to begin with is one half of their age. 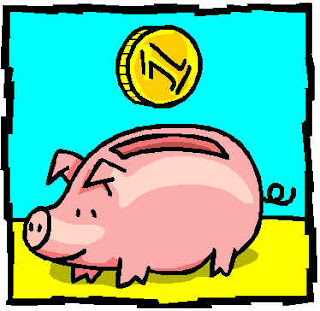 $3.00 for the 6 year old's seems like the right amount and we will ask them to contribute a bit towards Tzedakah (charity) each week to help them to learn to power of helping others in money and in deed. I think that amount will also help them with a bit of delayed gratification, as it take a bit of time to save up for a "bigger or better" item at that rate. I also like the idea of having it tied to assisting us with the purchase of other discretionary items such as refreshments at the movies or vacation souvenirs as examples. Just a bit mind you but enough to understand that there really is no money fairy waving a wand to make all those things possible. Also, we are not going to tie it to chores as we believe that the message that we want to continue to ingrain is that we all pitch in around the house as a family. That is just what is expected and money is not going to be the reward for it. If there is a much larger chore that we ask then there may be a reward for that, but it will not be the norm. That is also a difference from the past for me. Older and wiser I hope. I hope that this combination helps them to make wise choices but I know that there will be some tweaking as we grow. We just want to give them the best foot forward down this very treacherous road; one filled with so many glittery and desired items beckoning to them with their promise of momentary satisfaction and lots of long term pain in terms of repayment; over and over again on credit. Been there...done that....want more for my children!